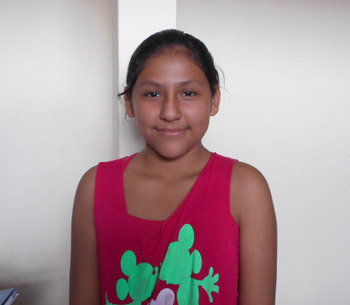 Iris is a middle-school student living in Santa Cruz, Bolivia. Originally from the town of Pasorapa, she moved to Santa Cruz with her mother and sister one year ago when her parents separated due to her father’s heavy drinking. They now live with her uncle Elmer, who works occasional jobs in screen printing. Her mom, Elina, set up a small storefront on her uncle’s front porch, and Iris helps run the store when she’s not at school. Since she was a young girl, Iris had always tired easily even when just walking to school. When she began to suffer chest pain and tachycardia, her mother took her to the hospital where doctors discovered Iris needed corrective surgery for a congenital heart defect. The $200 to $250 dollars Elina makes per month in her storefront is just enough to cover the basic living expenses for herself and her daughters. Fortunately, Iris was a good candidate to benefit from a cardiac surgery campaign organized at the Incor Clinic in Santa Cruz to treat cases like hers. Iris was overjoyed at the news that she would finally have a solution for her condition: I am very grateful for the help you are going to give me. I want to be able to do the things I like to do -- I want to live, I want to dance and do fun things!